The 2019 gardening season awaits us! We are anxious to begin another wonderful season of gardening with you! Please peruse some of our highlighted projects over the past several years and please don’t hesitate to click the Hire Us button in the menu bar above! Winter is a time for appreciation, contemplation and unobstructed time! We are enjoying making the most of this by honing our skills, returning to projects from the year past and working on designs and concepts for the coming seasons. We offer a wide array of services to help you create the garden you want. Services include but are not limited too. Providing you with delicate and persistent care we believe that a healthy, diverse, and balanced garden ecosystem are ways we can be good stewards of the Earth. Here we designed a peaceful meditation space for an enclosed outdoor courtyard. Working with the client we chose to create a loose stone patio and a plant design using shade plants which allowed us to respond to the existing artwork. Creating a calm and engaging space. A yard turns into a magical pollinator play land. Here we turned a strip of lawn with two narrow plant beds into a bountiful all season native pollinator garden. This native plant shade garden in Swisshelm park was planted in collaboration with a local garden designer. Dirt Landscaping installed the gardens, the gravel paths, laid the mulch, and placed stone borders for the planting beds and paths. With this garden we were able to start to build an understory mimicking that of PA woodlands. In a few years time where there was once a hard break between house, lawn, and the woodland edge you will find a smooth transition from nature to the indoors. After laying weed barrier and fresh sheet mulching but before the planting. We create, maintain, and care for your gardens like their are own. Dirt Landscaping offers many services besides garden design and installation. We want to work with you to create a seasonal maintenance plan that fits your garden. From waking your gardens up in the spring to putting them to bed for the winter we're there to offer you persistent and delicate care. 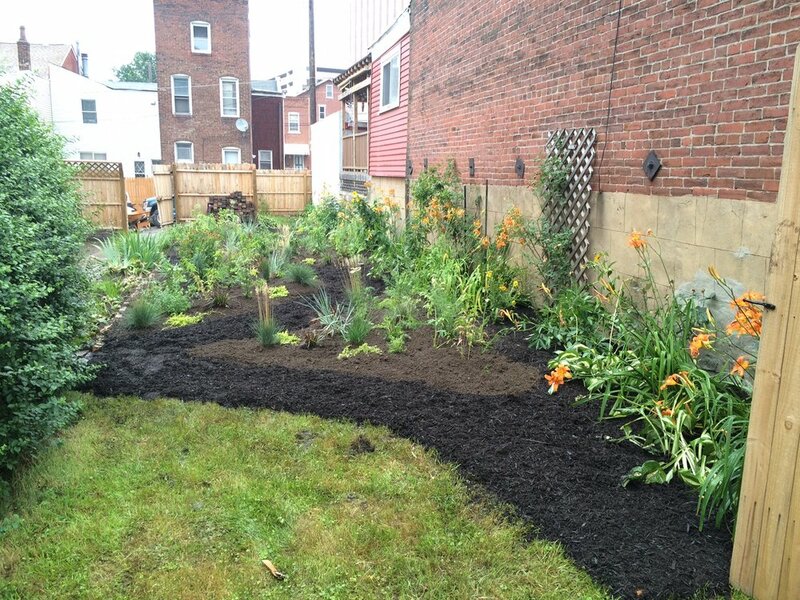 Example of an existing garden in Shadyside that we maintain with spring cleanups, mulching, weeding, dividing, composting, fall cleanup, and leaf removal. Weeding and mulching front garden beds for a home in Highland Park. Seasonal maintenance helps keep the original design in place in Polish Hill.